From clear liability catastrophic injury cases to complex multi-party pharmaceutical litigation , environmental poisoning cases and/or human rights cases, the Law Firm of Brian D. Witzer has been chosen by some of the state’s top attorneys for outright referral or collaboration. The Law Offices of Brian D. Witzer has previously acquired the personal injury practices of attorneys who are either retiring, have chosen to no longer practice law, or simply want an experienced, highly successful and well funded firm such as The Law Offices of Brian D. Witzer to join their case and assume lead trial lawyer status. Such collaborations are welcomed on matters in which referring counsel would otherwise not be as comfortable handling without the added resources and expertise of The Law Offices of Brian D. Witzer’s proven track record. 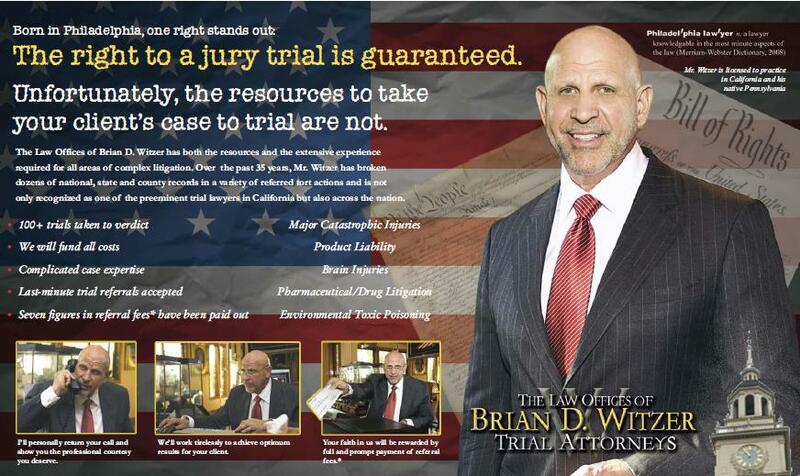 The Law Offices of Brian D. Witzer has won numerous multi-million dollar cases in precedent setting litigation. We take on last-minute trial referrals and pay the largest referral fees consistent with State Bar rules.